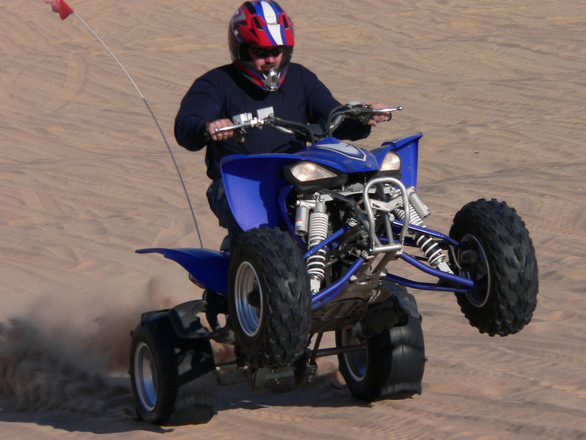 Riding an all-terrain vehicle, also called an ATV or “four-wheeler” can be a lot of fun, but it can also result in serious personal injury. There are a lot ways that an injury can occur on an ATV. In some cases, we are dealing with an inexperienced driver who has rented an ATV or is using one that belongs to a friend. It is also possible that a rider is seriously injured when sitting on the back on an ATV being operated by someone else. There is no seat belt on most of these vehicles, and it is not hard for a victim to fall and suffer serious injury or event death. In some cases, we are dealing with an experienced rider who is just going too fast and taking unnecessary risks. If a passenger is injured in this process who is not related to the operator, he or she might have a valid personal injury claim. In some cases, the vehicle will even be insured, and in other cases, a homeowner’s insurance policy might cover the victim’s damages for his or her injuries.According to a recent news article from ABC 7, a child is in critical condition following a serious ATV accident. Authorities have said this was a 12-year-old victim, and the serious accident occurred around 5:30 p.m. He was operating his own ATV and was riding alongside other ATVs. As he was attempting to go up a hill, his ATV wheel hit a large tree root, and this caused the ATV to flip over backwards and land on top of him. When first responders arrived, they found him seriously injured. They did what they could to stabilize his condition before rushing him to a pediatric level-one trauma center, and he was in surgery through the night of his injury and was in critical care the following day. It should be noted that there have been no accusations of negligence of any kind made in connection with this case. As our Boston personal injury attorneys can explain, if your child is injured when on someone else’s property and under the supervision of other adults, you may have grounds to file claim to compensate you for the losses suffered by your child and your family. This is not meant to punish another family who was doing their best to watch after your child when an accident occurred. Rather, if the other party is negligent in the care of your child, and that results in the serious injury or even death of your child, you family is entitled to a full and appropriate financial recovery. It should also be noted that in many cases, probably the clear majority, you would not have to file a lawsuit against the other party. In most cases, your experienced attorney will be able to reach a settlement with the homeowner’s insurance company. However, this is not true in every case, so you should speak with an attorney about how things will work in your actual situation.